A file system is required by many applications, for example by FTP and HTTP servers running on the DSP system. The D.SignT D.FAT file system provides this functionality. 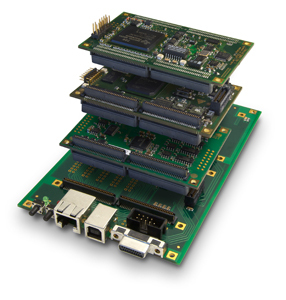 D.FAT supports ramdisks, SD- and MMC-cards and the onboard Flash memory of D.Module DSP boards. With user-provided low-level drivers, even SSD and harddisks are usable. D.FAT supports FAT12, FAT16 and FAT32 with 512 byte cluster size and file size up to 4G byte. Filenames use 8.3 format and full long filename support.